Held every 3 years, ACHEMA is Europe’s largest tradeshow for the chemical engineering and processing industry. The exhibition took place from 15-19 June 2015 in Frankfurt am Main, Germany. Russell Finex look back at ACHEMA 2015 where a positive atmosphere and good results made the show a great success. ACHEMA 2015 saw an increase in the number of exhibitors while the number of visitors stayed almost exactly the same. Covering 133,436 m² of exhibition space 3,813 exhibitors from 56 countries welcomed 166,444 visitors from around the world. Another trend which defined this edition of ACHEMA were the international visitors and exhibitors. For the first time more than half of the exhibitors came from outside Germany, with China being the second most represented country after Germany. Russell Finex have been an exhibitor at ACHEMA from the early beginnings, and as the show has grown so has Russell Finex. Ray Singh, Managing Director at Russell Finex comments: “ACHEMA has always been an important show for us. At ACHEMA we get in touch with both new and existing customers, learn about new projects and identify the industry’s latest trends and needs. It is also the largest and one of the most prestigious shows in Europe, where we proudly present our high quality separation equipment as well as new products we launch on the market. From participating at first with a small stand we have now grown to a 103m² representation. ACHEMA 2015 was again a successful show, we received many interesting inquiries showing the market overall is doing well." This year Russell Finex celebrate their 80th anniversary and ACHEMA was the ideal venue for a celebration. On 17 June Russell Finex organized an anniversary event inviting journalists and agents at their stand for live music, food and drinks. Managing Director Ray Singh shared a few words on how the company was founded in 1934 as a machinery construction company in London, and how it has grown to an international organization with 4 subsidiaries and a network of agents around the world. The future of Russell Finex is to continue to strive to remain market leaders in supplying high quality separation equipment. Innovation and premium customer service are still at the core of their daily business and have been a key to their success. At their stand Russell Finex showcased vibratory screeners and separators, industrial liquid filters and a dedicated spare parts section. 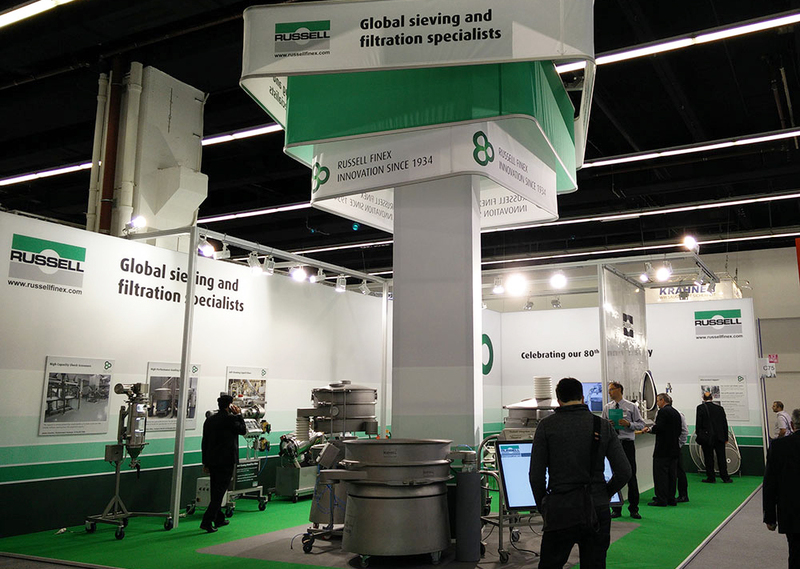 Newly developed products at the stand definitely worth mentioning are the Russell Screen Changer and a new model size of the Russell Compact Airlock Sieve™. The Russell Screen Changer makes changing mesh frames easy and less time consuming. 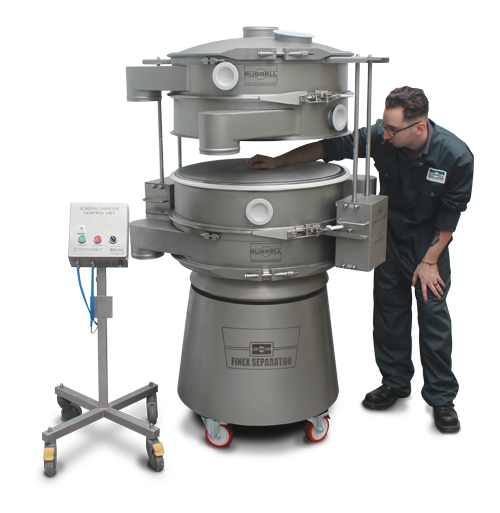 Installed on multi-deck grading sieving machines such as a Finex Separator™ or Russell Eco Separator®, the Russell Screen Changer lifts the deck(s) and enables an operator to remove the mesh frame and replace it without the need to dismantle the machine. 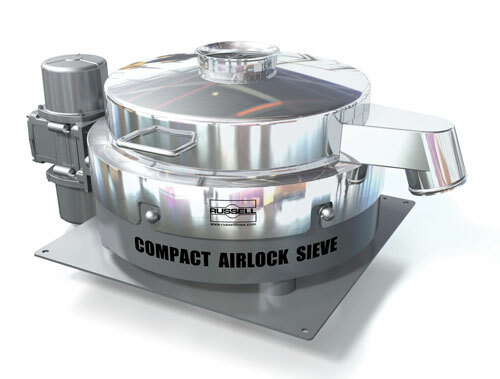 The Russell Compact Airlock Sieve™ is the first vibratory sifter which uses a patented TLI (Twist Lock Inflate) pneumatic clamping system instead of traditional clamping methods. By placing the component parts into the base, the lid locks by twisting and inflating the seal. The components are locked into place, providing OEL levels as low 1µg/m³ (OEL 5). Watch a new animation of this vibratory sifter and discover how exactly the Russell Compact Airlock Sieve™ works. For more information on other separation equipment displayed on the stand, read the ACHEMA show preview. If you missed Russell Finex at ACHEMA 2015, keep an eye on the events and news page to see where they are exhibiting next. The next ACHEMA in Frankfurt am Main, Germany will take place 11-15 June 2018.